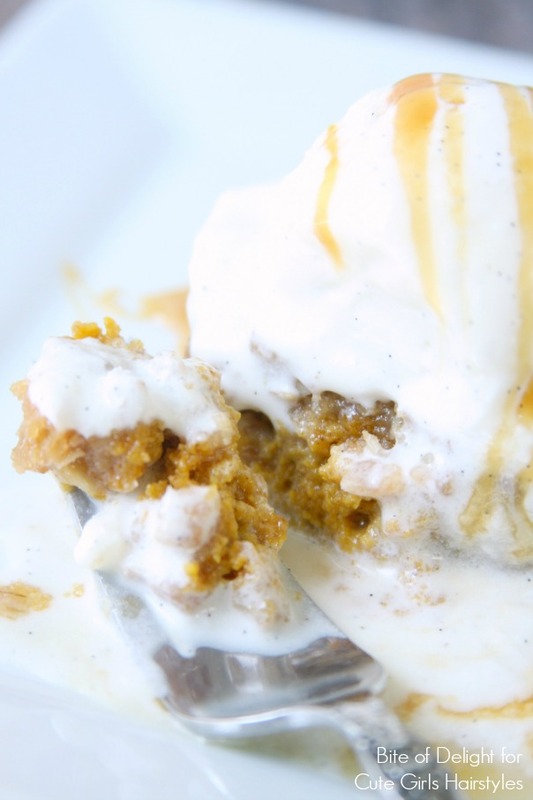 Pumpkin Pie Crunch is a fun twist on the traditional pumpkin pie. It’s easy to put together and great for serving a crowd. Everyone loves the crunchy layer, especially when it’s covered in ice cream and caramel sauce! 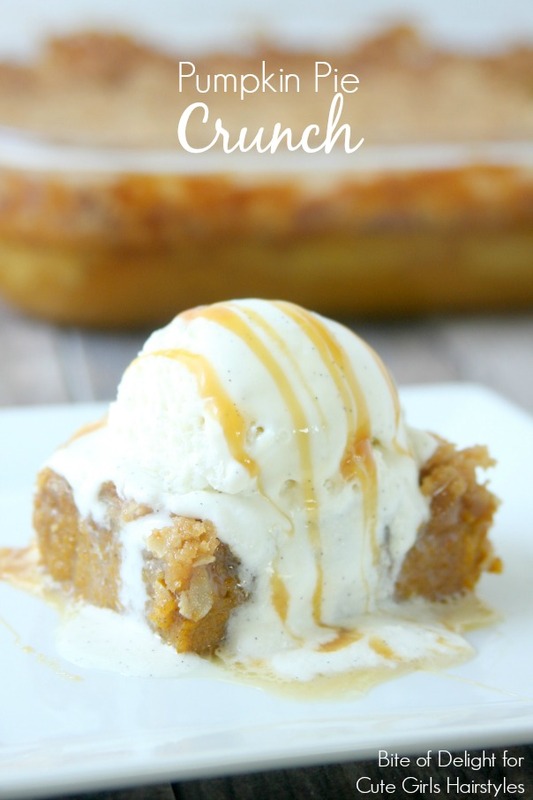 If you prefer a bigger crunch, bake the pumpkin pie layer half way before adding the crunchy topping. If you prefer a smaller crunch, add it before you put the pumpkin pie in the oven. It will sink down into the pumpkin a bit, exposing less of the layer to the outside heat, which will make it a little softer. They will taste the same, one will just have a little more crunch to it! In a mixing bowl, combine all ingredients for the pumpkin pie layer (pumpkin, milk, eggs, sugar, cinnamon & pumpkin pie spice). Pour into an ungreased 9×13 pan. Bake for 30-35 minutes, or until set but still soft. While the pumpkin layer is baking, prepare the crunch layer: in a separate bowl, combine the muffin mix, oats & brown sugar and combine. Cut in the butter until it looks crumbly (I like to use a fork). When the 30-35 minutes are up, remove from oven, sprinkle the crunch topping all over the pumpkin layer, then return to the oven for an additional 30-35 minutes. 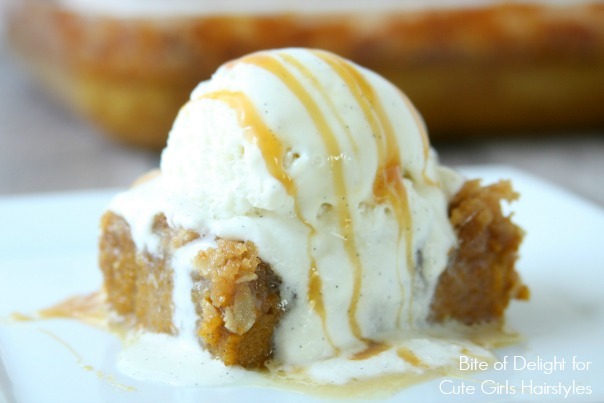 Cool slightly (the pumpkin will be soft) and top with vanilla ice cream and a drizzle of warmed caramel sauce. 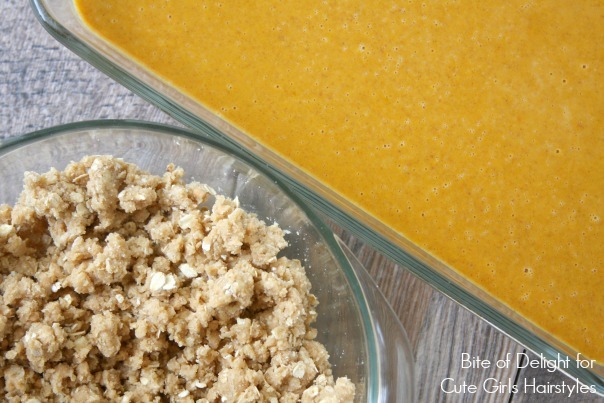 For a little bit softer topping, add the crunch layer before the pumpkin goes in the oven, and bake for 60-65 minutes. Pumpkin puree is NOT the same as canned pumpkin pie filling. Use 100% pure canned pumpkin. The brand of pumpkin I buy tends to come out of the can with a soft texture. If your pumpkin is firm, you may want to add more evaporated milk to the pumpkin mixture. The “Jiffy” brand of apple cinnamon muffin mix has little apple-cinnamon bits in it that melt in the oven and harden when cool. It helps give it that crunchiness. If you can’t find the “Jiffy” brand in your grocery store, it is readily available online.